Nobody pays much mind to advertising, at least the haphazard kind of advertising that clutters the space around us. But here in the 21st century, when both that space and the ads that appear throughout it are as likely to be digital as physical, we might take a moment to look back at how the practice of putting up notices to sell things began. In the English language, it goes back to at least to the mid-fifteenth century — specifically, to the year 1476, when Britain’s first printer William Caxton produced not just a manual for priests called Sarum Pie (or the Ordinale ad usum Sarum), but easily postable, playing card-sized advertisements for the book as well. It would have been important back then to make printed books look hand-copied, since not so long before, all books were hand-copied by definition. 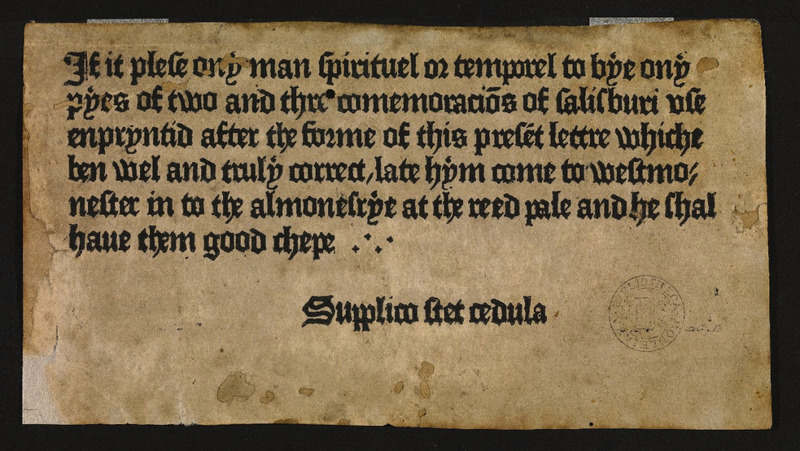 With the first Gutenberg Bible still less than half a century old, early printers had to make sure their relatively inexpensive books didn’t look like low-quality substitutes for the “real thing”; hence the assurances about both the type and the price in the text of Caxton’s advertisement. That the origin of advertising turns out to be closely connected with religion may come as a surprise — though given the fact that the print revolution itself began with a Bible, a product that in either physical or digital form now practically sells itself, it may not be that big a surprise. ← If you don’t visit Helsinki your vacation remains un-Finnished. Copyright © 2019 student-99.com. All rights reserved.